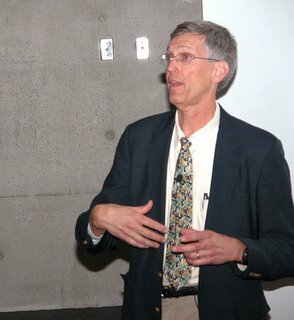 Technology physicist H. Jeff Kimble (photo posted) and his colleagues, in which they announced the first realization of entanglement for one "spin excitation" stored jointly between two samples of atoms across the room. In the Caltech experiment, the atomic ensembles are located in a pair of apparatuses 2.8 meters apart, with each ensemble composed of about 100,000 individual atoms. Since the work of Schrödinger and Einstein in the 1930s, entanglement has remained one of the most profound aspects and persistent mysteries of quantum theory. Entanglement leads to strong correlations between the various components of a physical system, even if those components are very far apart. Such correlations cannot be explained by classical physics and have been the subject of active experimental investigation for more than 40 years, including pioneering demonstrations that used entangled states of photons, carried out by John Clauser. In more recent times, entangled quantum states have emerged as a critical resource for enabling tasks in information science that are otherwise impossible in the classical realm of conventional information processing and distribution. Some tasks in quantum information science (for instance, the implementation of scalable quantum networks) require that entangled states be stored in massive particles, which was first accomplished for trapped ions separated by a few hundred micrometers in experiments at the National Institute of Standards and Technology in Boulder, Colorado, in 1998. In Caltech experiment, the entanglement consisted of a quantum state for which, when one quantum spin (i.e., one quantum bit) flipped for the atoms at the site L of one ensemble, invariably none flipped at the site R of the other ensemble, and when one spin flipped at R, invariably none flipped at L. Yet, remarkably, because of the entanglement, both possibilities existed simultaneously. This breakthrough represents an important advance relevant to the foundations of quantum mechanics and to quantum information science, including the possibility of scalable quantum networks (i.e., a quantum Internet) in the future.